Tempura is a classical dish in Japan and served often as a main dish. It is heavy, but deep fried vegetables and seafood are delicious. Try your own version of tempura with this basic recipe for tempura batter. Keep in mind: the colder the batter the crunchier the tempura. Add salt to the flour. Then add the baking powder and whisk the flour-mix thoroughly. Add the vegetable oil to the flour and whisk together. Gradually add the sparkling water. For crispy results, make sure the water is cold. 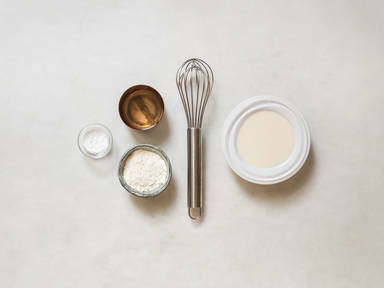 Whisk thoroughly until a smooth texture. The batter is now ready for vegetables or seafood.